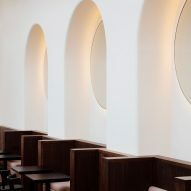 London studio Carmody Groarke has completed a top-lit members' room at the Victoria & Albert Museum, featuring mirror installations that provide reflected views of spaces inside and outside the building. The office led by architects Kevin Carmody and Andy Groarke was awarded the project in 2016, following a competition that also attracted entries from David Kohn Architects, Ordinary Architecture, SHH and Universal Design Studio. 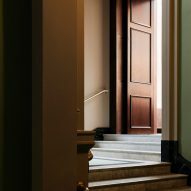 The new space dedicated for use by V&A members is situated in a converted gallery on the fourth floor of a wing designed by architect Aston Webb and completed in 1909. The room overlooks the recently unveiled tile-covered entrance and subterranean gallery designed for the museum's new Exhibition Road Quarter by Amanda Levete's firm AL_A. The room was previously a study area between 1916-1921, before being used as the National Art Library offices. 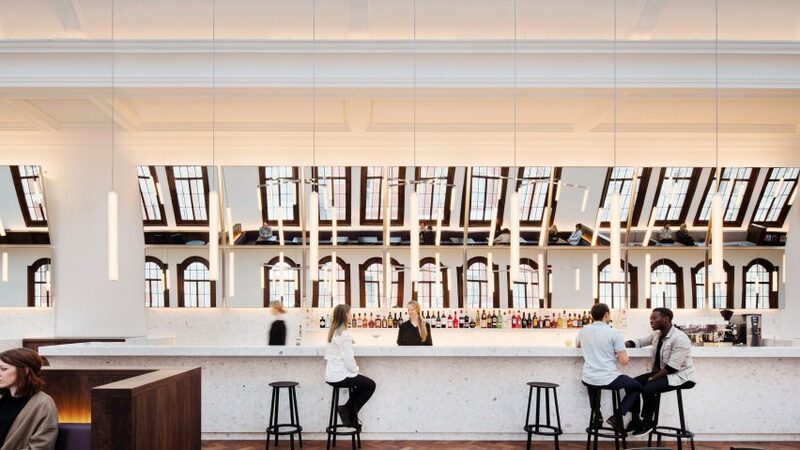 The architects sought to retain its spatial quality when converting it for use as an all-day brasserie, bar and events space. "Architecturally, the creative adaptation of the original gallery, which is both magnificent in character and vast in scale, has been envisaged as part of the natural continuum of the museum fabric," said a statement sent to Dezeen. "The designs have subtly restored and retained existing spatial or detail character and where appropriate reinvented architectural features including lighting and furniture." The large space is illuminated from above by existing roof lights, and daylight also enters through windows that overlook The Sackler Courtyard. The architects raised the floor level by half a metre to ensure visitors can look out the windows. The floor itself is made from parquet reclaimed from throughout the museum. A light well lined with a classical balustrade visually connects the top-floor gallery with the levels below. Large mirrored panels installed alongside the opening reflect views up into the room and vice versa. A further row of mirrors behind the bar captures views through the windows. 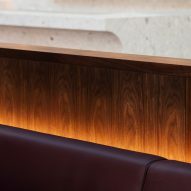 The bar itself is a monolithic piece of terrazzo, chosen to reference the room's white-marble entrance staircase, and carved with a profile that echoes the form of the moulded ceiling. Furniture is used to define smaller areas within the Members' Room, with leather-seated benches complemented by chairs and marble-topped tables designed especially for the space by Carmody Groarke. Other furniture includes a recommissioned version of Alvar Aalto's stackable 403 armchair, as well as bar stools by HAY. These products offer a subtle nod to the room's positioning above the museum's 20th-century collections. Artificial lighting is provided by fluted-glass pendants, which the architects developed based on the gallery's original light fittings. These are arranged in clusters based on the lighting requirements of each area. Carmody and Groarke founded their studio in 2006 and have since worked extensively on a wide range of arts, cultural, heritage and residential projects. The firm has designed a house in north London featuring three brick volumes facing into woodland, and plans to add a clifftop suite to a hotel on an island off England's south coast.